Large sham ideal for Twin XL Bedding & Pillows 20"x26"
Use over an existing pillow you own or add our jumbo pillow for a perfect fit! Dorm Co. Tip: Add to dorm room decor while adding luxurious pillow shams to your college dorm bedding! You've picked out your Twin XL Comforter and Twin XL Sheets and you're incredibly happy with what you chose. You've got your dorm rug that matches your dorm bedding and some pretty cool looking dorm desk college supplies. You still feel like something is missing and you can't figure out what. DormCo is here to help you! Add our Dorm Bedding Sham to your Twin XL Dorm Bedding to complete your dorm room decor style! Our Dorm Bedding Sham is available in two colors to match your Twin XL college dorm bedding! Our Dorm Bedding Sham is available in white and beige which means whatever color your dorm bedding is, these Dorm Bedding Shams will match what you have! Dorm Bedding Shams are cheap dorm supplies that complete the effect of your dorm room style and make a truly stunning dorm room. 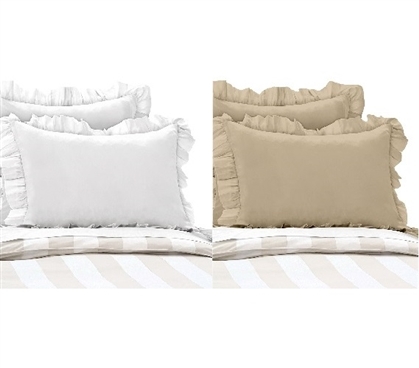 These are supersoft dorm pillow shams that add to luxurious dorm bedding with a delicate ruffle around the Dorm Bedding Sham. Put these dorm essentials around your existing college pillow or add to our jumbo college pillow for comfort you can sink into for a quality night's sleep!